There's so much to do in Ocean Grove! Ocean Grove truly is a town for all seasons. Did you know that Ocean Grove has more authentic Victorian architecture than anywhere else in the United States? It is a beautiful town founded to provide respite after the Civil War. Ocean Grove has a wonderful, pristine beach with a non-commercial boardwalk. Main Avenue has quite a variety of shops and great restaurants! 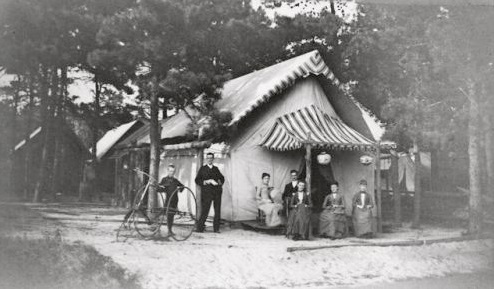 The Society is also dedicated to educating the public about the historic contributions made to the USA by the residents, visitors and governing bodies of Ocean Grove; about Victorian life and architecture, and the restoration of Victorian structures in the community. They operate a wonderful living history museum and a beautiful Centennial Cottage. Please support their wonderful work! Be sure to stop by for a tour of the Centennial Cottage. No visit to Ocean Grove would be complete without stopping into the Historical Society of Ocean Grove Museum! The wonderful people there would love to show you around! Have you ever wondered what it would be like to live in a tent for the summer? Now is your chance to take a tour of one! The Historical Society of Ocean Grove offers walking tours! There is always something doing at the Great Auditorium. There is a headliner concert every Saturday night and the tickets are always reasonable. Click here for tickets! Twice a year they hold a Giant Flea Market and the Craft Fair is always fabulous! There are Ice Cream Socials and other special family friendly events. While in Ocean Grove, you have to check out the Tent City! Yes, people actually live in tents the entire summer. Fortunately they now have running water and electricity, but they are still tents! Click here for a List of Events sponsored by the Ocean Grove Camp Meeting Association including concerts held at the Great Auditorium. Click here for a List of Events sponsored by the Ocean Grove Chamber of Commerce including the flea markets, craft fair and car show. Asbury Park is also fantastic. Just a short walk away to the wonderful shopping and dining on the boardwalk and Cookman Avenue. And don't forget to check out our friends at Asbury Pedal Boats located on the lake. After 50 years the Swan Boats are back! This year they even have a cool pirate ship complete with pirate's booty for your little buccaneers! Why are the pedal boats so fantastic? "Quite simply, it’s a chance to have lots of fun after a beautiful day on Wesley Lake with Historic Ocean Grove as a backdrop. The swans offer the perfect time together with the kids or friends and family – it’s a chance to make special memories that will last a lifetime." No trip to Asbury Park is complete without a trip to the World Famous Silver Ball Museum Arcade. This place is a Must See! They have every awesome game and pinball machine you can think of. They graciously provided us with discount coupons so you can play the day or the night away at a discounted rate! You pay one reasonable price and play all day. The kids will love it--even the BIG kids! It is located on the Asbury Park Boardwalk and just a short walk from our inn. Don't forget to check out the Stone Pony and the Convention Center just a short walk from our inn. Click here for the Asbury Park Events Calendar. The World Famous Stone Pony is only a short walk from our inn! Just a short walk down the boardwalk is the town of Bradley Beach. Click here for Bradley Beach events. Please check back soon for more information regarding local events and activities. Thank you for visiting our website.